In the coming days, one of Orleans County’s most unsung heroes will be on the Vermont Voice radio show, and on the Northeast Kingdom Voice television show. Sharon Stewart of Newport, a certified personal trainer, has spent more than three decades working to get, and keep, people of the region in shape. Known for her big heart and boundless energy, Sharon also uses her talents and energy to help people in need. On the shows, she’ll will talk about her mission to help people improve their lives. She’ll also talk about upcoming class offerings. The VT Voice airs on Sunday mornings at 6:30 on WJJZ Country on 94.5 FM. in Derby. 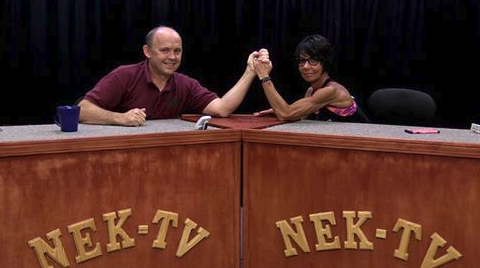 The Northeast Kingdom Voice airs on NEK-TV Channel 17 on Monday at 6 p.m. and Wednesday at 7:30 p.m. The shows are later posted here.